Sushi exists under many forms and guises. It is not all nigiri and (more ubiquitous) sushi rolls! Have you ever heard of Oshizushi? 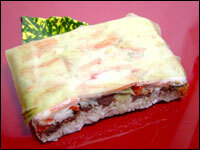 Oshizushi (押し寿司, litterally pressed sushi), is a pressed sushi from the Kansai Region, a favourite and specialty of Osaka. 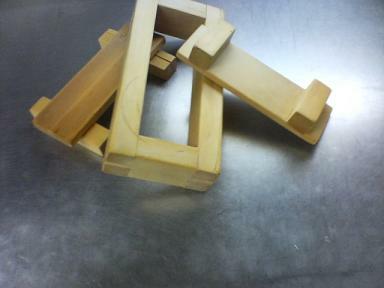 It is made with the help of a block-shaped piece formed using a wooden mold, called an oshibako/押し箱. 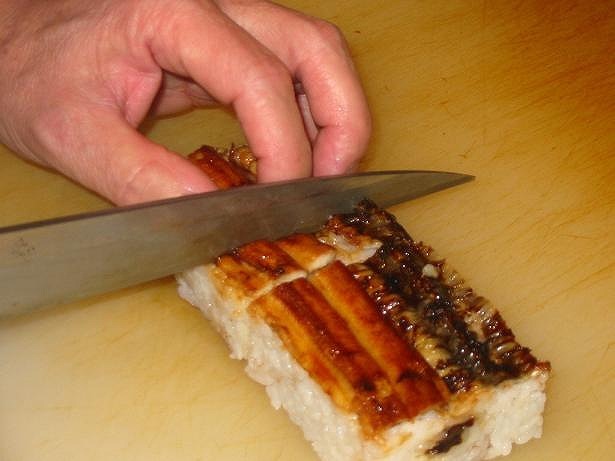 The chef lines the bottom of the oshibako with the toppings, covers them with sushi rice, and then presses the lid of the mold down to create a compact, rectilinear block. The block is then removed from the mold and then cut into bite-sized pieces. It is great fun to experiment at home for large parties or the family as you can include almost anything. 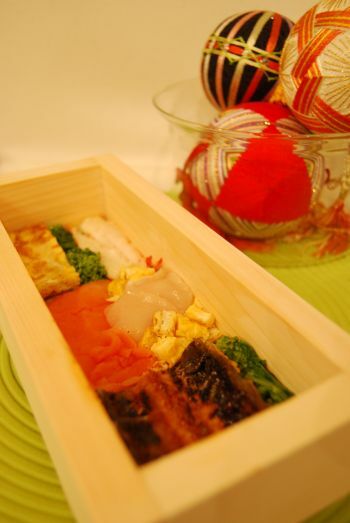 Moreover, oshizuhi is easy to transport and include in bento! 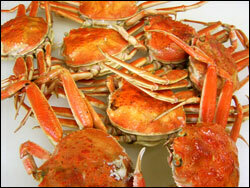 Seikogani is the Japanese name for the female Snow Crab or Zuwagani, when she is bearing her eggs. 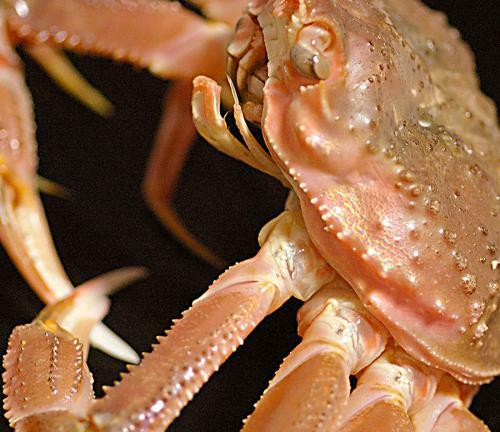 Contrary to many other kinds of crabs, the female snow crabs, even when bearing eggs, lose little of their food and taste quality with the added advantage of an extra delicacy and taste. On the other hand the main food is found inside the shell instead of the legs and pincers for the males. Therefore, if you get your hands on such a specimen, do not ignore it, even if they are noticeably smaller than their male counterparts! The best is actually to combine both male and female into a combination sushi. 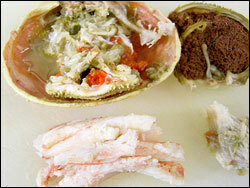 Above are the shells of two snow crabs, the large male one containing white flesh and red brains from both male and female, the smaller female one containing the eggs, and the flesh taken out of the male legs after boiling and cooling. 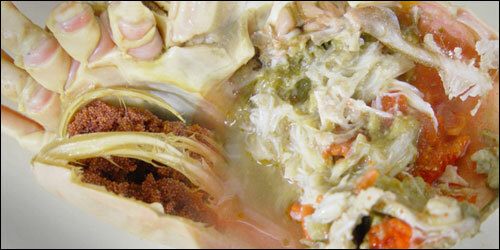 See above picture for better view of the edible morsels: white flesh, red brains (don’t forget these!) and eggs. As there is a danger of a general crumbling out of the ingredients, line the bottom of the oshibako/box with a good layer of light seaweed first instead of doing it after you have unloose the sushi out ofits box. Then place legs flesh tightly parallel to each other to form as compact as possible layer. Cover the leg flesh with the eggs and red brains into a pleasing design. Finally fill with sushi rice and press. Unloose sushi from its box and cut to size before serving! Where do you find the Oshibako in America? It should be quite easy to find on the Internet. If you can’t write me again! This is sooo attractive! 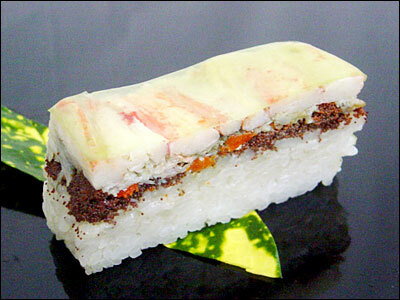 I love sushi, it is amazing how the colors are always bright and appealing and the taste most of time does not fail.